Poster’s Note: One of the many under-appreciated aspects of NASA is the extent to which it publishes quality science content for children and Ph.D.’s alike. Your tax dollars help promote science! The following article was provided for reprinting by the Night Sky Network in April, 2019. 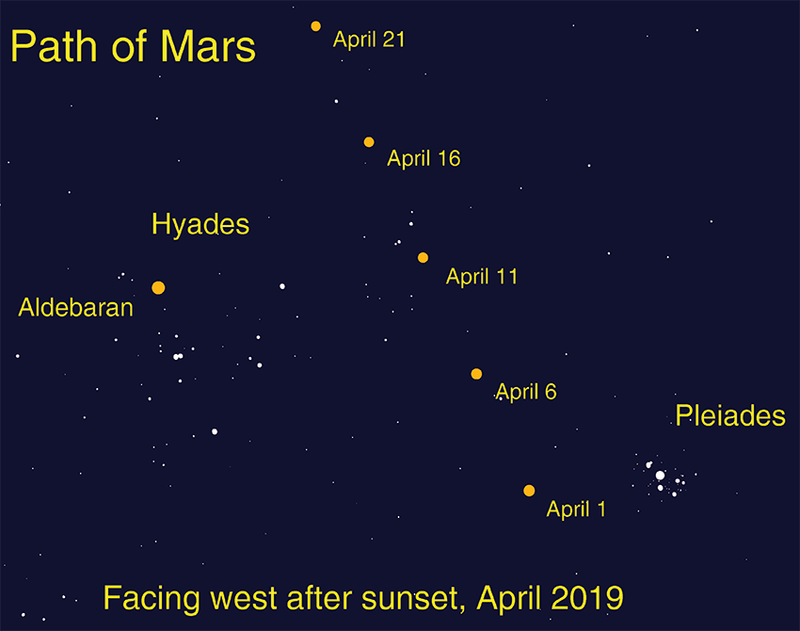 You can watch Mars as it wanders through the sky throughout April, visible in the west for several hours after sunset. Mars travels past two of the most famous star clusters in our night sky: the Pleiades and Hyades. Look for the red planet next to the tiny but bright Pleiades on April 1st. By the second week in April, it has moved eastward in Taurus towards the larger V-shaped Hyades. Red Mars appears to the right of the slightly brighter red-orange star Aldebaran on April 11th. 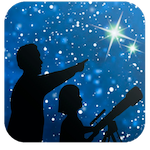 We see only the brightest stars in these clusters with our unaided eyes; how many additional stars can you observe through binoculars? Open clusters are made up of young stars born from the same “star nursery” of gas and dust. These two open clusters are roughly similar in size. The Pleiades appears much smaller as they are 444 light years away, roughly 3 times the distance of the Hyades, at 151 light years distant. Aldebaran is in the same line of sight as the Hyades, but is actually not a member of the cluster; it actually shines just 65 light years away! By comparison, Mars is practically next door to us, this month just a mere 18 light minutes from Earth – that’s about almost 200 million miles. Think of the difference between how long it takes the light to travel from these bodies: 18 minutes vs. 65 years!